Aspen private parties are a once in lifetime experience meant to be enjoyed with the very best people at the very best venue possible! The best parties start and end in the kitchen…Mawa’s Kitchen! 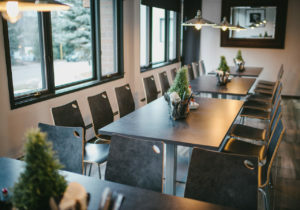 Mawa’s Kitchen is the perfect place for an anniversary party, private or corporate event, birthday parties, bridal showers, bachelorette parties, team building classes, and cocktail receptions. We will prepare the menu, the wine, cocktails and decorations. We do all the set up and clean up so you are free to enjoy time with your guests. Our beautifully renovated dining room comfortably seats up to 26 guests. Our kitchen is fully outfitted with professional-quality tools and equipment in an inviting setting. Mawa’s Kitchen is a place for people who love food — eating it, preparing it, and talking about it. We’ve turned culinary education into a dinner party, selected some great wines, and added you to our guest list. As your hosts we guarantee a memorable dining experience like no other.